International Journal of Research in Health Sciences,2014,2,1,172-176. 1,3,6-Assistant Professor. 4,5-Associate Professor. 2-Professor and Head, Department of Community Medicine, Dayanand Medical College & Hospital, Ludhiana, Punjab, INDIA. Background: The worldwide prevalence of diabetes mellitus has risen dramatically in the developing countries over the past two decades. It’s a serious public health problem that threatens the quality of life of patients, the success of long-term maintenance therapy for diabetes depends largely on the patients’ compliance with a therapeutic plan. Material and Methods: The study was done in rural field practice area of department of community medicine amongst known diabetic’s of Ludhiana. 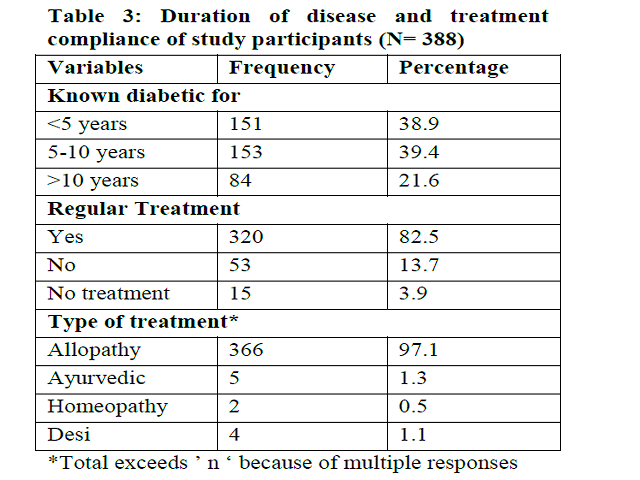 Structured questionnaire was used to assess the practices of known diabetics. Information regarding knowledge of taking regular medications, routine check up, type of treatment, lifestyle modification dietary pattern and exercise program was collected. The data was analyzed by using statistical software SPSS version 20. Result: The results of this study regarding patient compliance revealed that 82.5% gave history of regular intake of medications while 13.75% were irregular in taking treatment. Regarding the adherence to blood glucose monitoring, it was seen that 80.4% of patients were on regular blood sugar checkup, while 19.65% subjects were irregular. 54.8% subjects accounted unawareness as the main reason for irregularity in glucose monitoring. Conclusion: Despite the increasing prevalence of diabetes, improved understanding of the disease, and a variety of new medications, glycemic control does not appear to be improving. Monitoring of blood glucose is one strategy for improving glycemic control; however, patients adherence is suboptimal and a proper education and follow-up are crucial.